The story of eelgrass, Z. marina, would not be complete without mention of Wasting Disease. 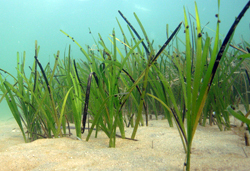 Like the bubonic plague of seagrasses, wasting disease was responsible for the disappearance of 90% of eelgrass in the 1930's along the Atlantic coasts of North America and Europe (Muehlstein, 1989). 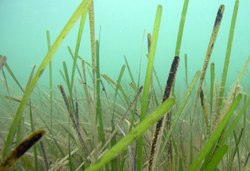 Though Z. marina has made a moderate return since then, the disease still affects eelgrass beds in North America and Europe and has been deemed responsible for some recent losses, though none as catastrophic as the epidemic of the 1930’s (Short et al., 1986, 1988, 1993a; den Hartog, 1994). Although numerous theories were suggested as to the potential cause of wasting disease after the epidemic of the 1930’s, the most current studies suggest that the pathogen responsible for the infection is a marine slime mould-like protest Labyrinthula zosterae Porter and Muehlstein (Short et al., 1987; Muehlstein et al. 1991; Ralph and Short, 2002). 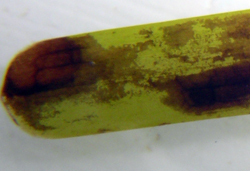 Investigators of the disease have theorized that L. zosterae is actually a secondary decomposer of old/senescent leaves (den Hartog, 1987) and that the L. zosterae infection in Z. marina is linked to already stressed eelgrass (Young, 1943; Tutin, 1938; Rasmussen, 1977); healthy tissue can generally resist infection (Vergeer and den Hartog, 1994). 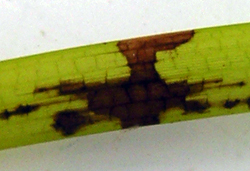 Wasting disease spreads through direct leaf to leaf contact and can be identified by black-brown dots or streaks on the leaves leading to patches, larger blackened spots, and longer streaks (Short et al., 1988; Muehlstein, 1989). The extent to which the disease has spread is greater than what can be seen visually though, as the infection moves rapidly through tissues, initiating enzymatic degradation of eelgrass cells and destroying cell cytoplasm (Ralph and Short, 2002; Muehlstein, 1992). Photosynthetic activity is reduced, creating a negative carbon balance which ultimately leads to mortality. (Ralph and Short, 2002; Larkum, Orth & Duarte, 2007). Salinity is an important factor regulating the onset and severity of eelgrass wasting disease in that at lower salinities (~20ppt) when eelgrass begins to stress, the Labyrinthula pathogen is stimulated (Muehlstein et al., 1991; Burdick et al. 1993). It is crucial for us to have a clear understanding of the disease and what regulates it because of its ability to constrain the prosperity of eelgrass. With most local eelgrass populations already declining due to human-induced pressures, any loss could be devastating. Because of this, we recently collaborated in a Wasting Disease project in April of 2008 that involved collecting samples from several local meadows and sending them the lab for genetic screening and comparison. This work is part of a larger effort already underway in the Chesapeake and in Puget Sound, and we hope that it will help us understand the extent to which the disease is naturally present in Long’s Island’s eelgrass populations, whether we are vulnerable or susceptible to another outbreak, and what we can do to prevent the disease from spreading during our restoration efforts. **Photo credit: Labyrinthula was isolated from eelgrass collected from Fisher's Island using the methods of Muehlstein et al. (1988). It was isolated by students Jaci Benson and Laurie Hofmann of St. Mary’s College of Maryland, students of Chris Tanner, professor of biology. Burdick, D. M., F. T. Short, and J. Wolf. 1993. 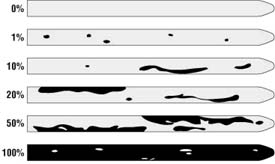 An index to asses and monitor the progression of wasting disease in eelgrass Zostera marina. MEPS 94: 83-90.
den Hartog C. 1987. Wasting Disease and other dynamic phenomena in Zostera beds. Aquat Bot 27: 3-14. Muehlstein LK, Porter D, Short FT. 1988. Labyrinthula sp., a marine slime mold producing the symptoms of wasting disease in eelgrass, Zostera marina. Mar Biol 99:465-472. Muehlstein LK. 1989. Perspectives on the wasting disease of eelgrass Zostera marina. Dis Aquat Organ 7: 211-221. 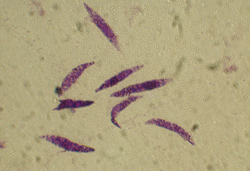 Muehlstein LK.1992.The host-pathogen interaction in the wasting disease of eelgrass, Zostera marina. Can J Bot 70: 2081-2088. Muehlstein LK, Porter D and Short FT. 1991. Labyrinthula zosterae sp. Nov., the causative agent of wasting disease of eelgrass, Zostera marina. Mycologia 83: 180-191. Ralph PJ and Short FT. 2002. Impact of the wasting disease pathogen, Labyrinthula zosterae, on the photobiology of eelgrass, Zostera marina. Mar Ecol Prog Ser 228: 265-271. Short FT, Mathieson AC and Nelson JI. 1986. Reoccurance of the eelgrass wasting disease at the border of New Hampshire and Maine, USA. Mar Ecol Prog Ser 29:89-92. Short FT, Ibelings BW and den Hartog C. 1988. Comparison of a current eelgrass wasting disease to the wasting disease of the 1930’s. Aquat Bot 30: 295-304. Short FT, Burdick DM, Wolf J and Jones GE. 1993a. Eelgrass in Estuarine Research Reserces Along the East Coast, USA. 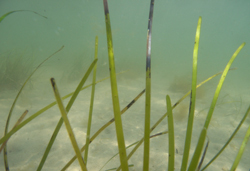 Part 1: Declines from Pollution and Disease and Part II: Management of Eelgrass Meadows. NOAA- Coastal Ocean Program Publication, p 107. Short FT, Muehlstein LK and Porter D. 1987. Eelgrass wasting disease: Cause and reoccurance of a marine epidemic. Biol Bull 173: 557-562. Tutin TG. 1938. The autecology of Zostera marina in relation to the wasting disease. New Phycologist 37: 50-71. Vergeer LHT and den Hartog C. 1994. Omnipresence of Labyrinthu;aceae om seagrass/ Aquat Bot 48: 1-20. Young EL. 1943. Studies on Labyrinthula. The etiologic agent of the wasting disease of eelgrass. Am J Bot 30: 586-593.